Intelligence is something that we all aspire to; and something that in turn makes us aspire to an even greater self. Our conscience yearns to be nourished, for a well fed mind can discover the true essence of the soul that hides within the mortal form; and in that sense music is most certainly a delicacy that can open the buds of even the dullest palettes. Yet not all music can quench the appetites of a growing mind, and sometimes, only a solution of Prog. can fill those famished brain cells with the musical nutrients that they so require. Progressive Metal has long been the professing voice of wisdom within the often misguided ranks of our beloved genre, for its complexity and emphasis on cerebral songwriting always provide a generous serving of food for thought. 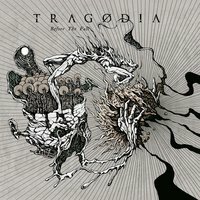 The Italian quartet TRAGODIA are no different, and on their 4th full-length effort “Before The Fall” the band seem hell-bent on ultimately uniting as one the minds, bodies, and souls of their listeners. “Before The Fall” opens big with the piercing riffs of “The Untrodden Road”, which sound something like what your synapses might emanate as they work to pave a sensory path for this musical stimulation to be comprehended. “The Untrodden Road” is truly a solid opener, for its marvellous of dynamic shifts within the rhythmic progressions create a captivating listening experience that makes each section like an action packed paragraph that entices you to find out what comes next. This astute approach to songwriting is also evident in tracks like “The Fifth Season” and “Adrift”, both of which employ heavy, rolling riffing as kinetic sources for oncoming experimentations and tonal shifts – as seen in “Adrift’s” acoustic elements and “The Fifth Season’s” tasteful electronic presence. The latter is also noteworthy for its demonstration of one of this record’s subtle, but defining sonic characteristic, as it explores the almost Trance-esque undertones that resonate of keyboard driven German Gothic Metal outfits like CREMATORY. For all its smarts, “Before The Fall’s” true power lies within its soul. As you listen to this record and its cognitive capabilities, it is its emotional depth and passion that stand out above all of its progressive traits. And it is in the epic title track – and its ambient, palette cleansing instrumental interlude/intro “Of Dark Suns and Dying Stars” – that we find the heart of this enterprise, as TRAGODIA take you on an stirring tour de force that echoes of great 80’s Metal ballads and poignant, unadulterated romanticism, and invites you to metamorphose along with its grooves and melodic caresses, altering your emotions for the better in the process. Granted there are moments when “Before The Fall” is less than savvy, as you come to realise that the tracks are somewhat formulaic of the typical Prog. approach and stylistic tendencies, which often makes this album for a rather run-of-the-mill listen; particularly in the latter third. The overly monotonous choruses are also a source of great pain for the otherwise mightily driven tracks, as they simply lack the firepower to follow the high-octane verses. The production, nevertheless, is superb - although the lead guitars may have benefitted the tracks by being higher in the mix – and the performances of the band are of the highest order - compelling, professional, and purely masterful. Overall – let “Before The Fall” seep into the fold of that grey matter, for you’ll most certainly enjoy it. Yes, this may that overly familiar Prog. sound that you’ve been listening to for years, but you can’t deny that it sounds damn good. TRAGODIA’s fourth release is headstrong and heartfelt, and that how a solid Metal record should be.